A collaboration with the amazing and talented Lady Jaded - A day in the Life of Harley Quinn. Harley Starts the day with some tinkering with nature, and bunnies! What can possibly go wrong ;-) Next, Harley goes shopping with her BFF, Poison Ivy. Of course they never intended to pay for their selections. After the shopping, Harley finds someone (probably her Puddin') left her a gift to play with, I'm not so sure that Robin was all that upset. 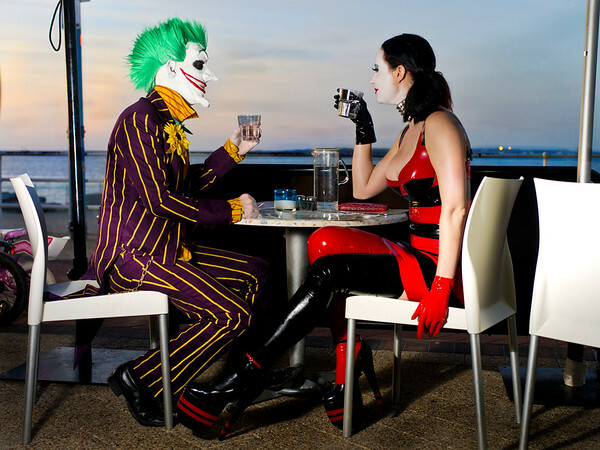 Time to catch up with Puddin' and a bite to eat, just relaxing as normal people do at a restaurant on the foreshore. After that it's time to let her hair down and party at a club with Catwoman and Ivy. Many thanks to: Betty Blue Bistro for letting us shoot during a Sunday evening dinner session. The reaction from the other diners and people walking past was priceless  Nawty Secrets for inviting us along to run amok in their shop, we had a blast. Voodoo lounge for access to the club.